I thought it might be helpful if we had a separate thread to discuss issues and newly discovered rules building a GLE. To get things started I found new rules not clarified in the DOG when selecting Driver Assistance Package PLUS. 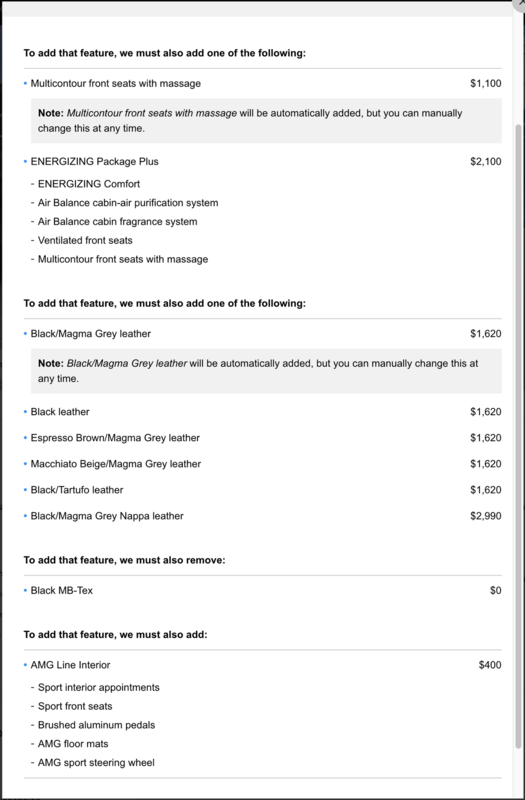 Both rules cannot be correct so I'm guessing the configurator is wrong since I ordered Driver Assistance Package PLUS but didn't order AMG Line Interior. Selecting E-ACTIVE BODY CONTROL on the Performance & Safety tab does nothing. Give it time cause I'm guessing the site still has bugs that need to be addressed. I noticed a few things have been fixed on the configurator. Last edited by JoeMa; 03-08-2019 at 06:49 AM. I noticed the Driver Assistance Package Plus can now be added to the 350 on the site.